My thinking hasn't changed much since yesterday, although I did make a few minor adjustments based off today's model runs. You can read how I've come to this forecast below...although I know the majority of people just want to know what it's going to do and when so here's the final call.. Projected start times: I did push the northern half of Virginia back an hour or two since it's looking like precipitation may be a bit slower to move into that area. Some areas along and east of I95 in southeastern Virginia may change over to rain for a time. I think the snow/sleet mix line pushes as far west as a line from Danville to Fredericksburg. Still some questions as to how far south this last band will reach (could end up being confined to areas north of I-64 with a dry slot punching into south east VA or...could stretch as far south as the NC/VA border). Won't really have a great idea until it sets up. It will have the potential to put down some impressive snow rates wherever it does (1-2" per hour). I believe heaviest snow amounts end up right along and east of the Blue Ridge Mountains (Lynchburg, Charlottesville, Wintergreen, western DC suburbs) where there will be some upslope enhancement initially with easterly flow out ahead of the low...and then with the deformation band passing through as the storm departs. My forecast continues to be mainly a blend of the Euro and Canadian...weighted towards the Canadian with some climatology thrown in. I did take the nam/gfs into consideration as they've made steps towards the foreign models over the course of the day. 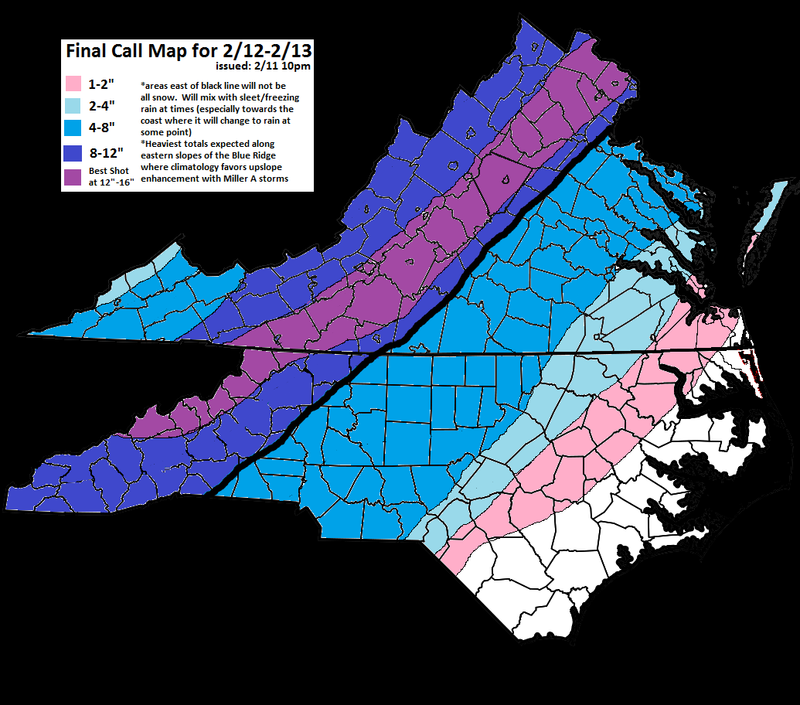 Discussion from Blogs Earlier Today Concerning Thundersnow Chances and Why I think most of the Greater Richmond area and points east of there have mixing issues that hold down snow totals a bit. It's looking like parts of the area will have the potential to see thundersnow with very heavy snow rates of upwards of 1-2" per hour Wednesday night into Thursday. 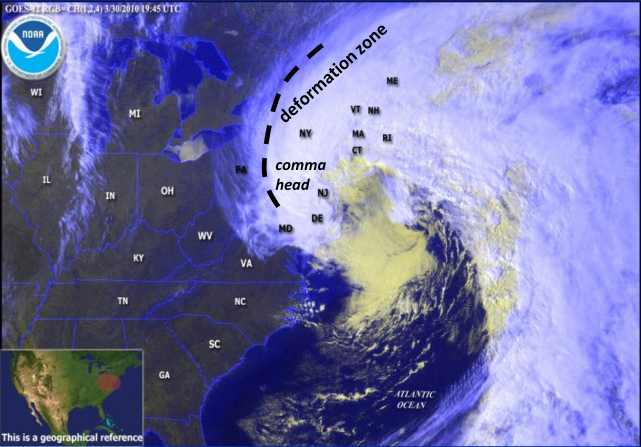 The greatest potential of this will occur with the passage of the deformation band (see below). These form when warm, moist air ahead of low pressure centers get wrapped up and around the low. This leads to winds blowing together at the surface and apart at the midlevels; creating a bit of a vacuum for air to rapidly rise. This is often referred to as the "comma head." The vertical velocity on the right shows where some of this greatest lift in this band will be. 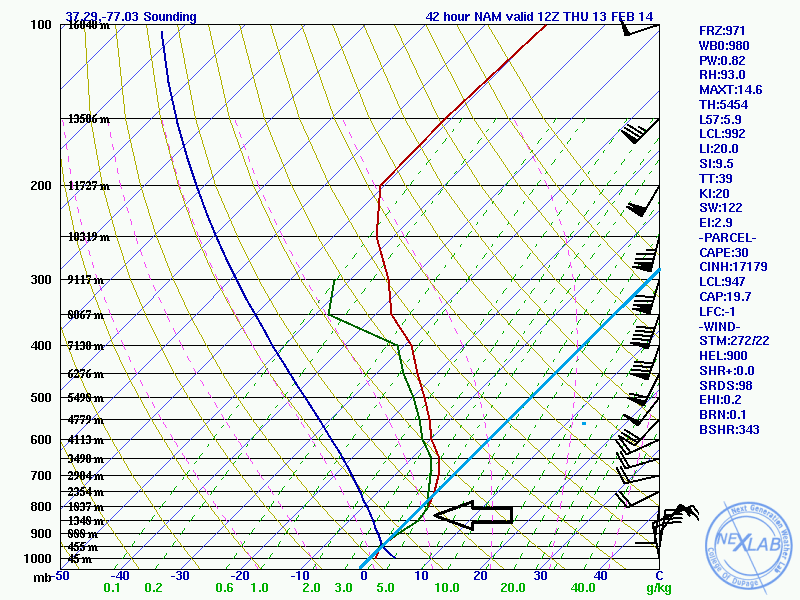 Soundings also showing signs of some slantwise convection setting up. PRODUCING SNOWFALL RATES OF 2 INCHES PER HOUR WITH ISOLATED THUNDER... WEDNESDAY NIGHT. One of the biggest forecasting challenges with this storm has been forecasting snow amounts for the I-95 area in Virginia. The discrepancy over how much areas like Fredericksburg/ Richmond/ Williamsburg/ Emporia see is going to come down to how much of this precipitation falls as snow. Just wanted to clarify my thoughts and why I see things playing out the way I do. I understand the excitement over the past several runs of the nam/gfs that have shown the Richmond area getting absolutely plastered on the snow maps with 12+" of snow. However, these maps do an awful job distinguishing between what falls as snow and what falls as sleet/freezing rain. I'm going to use the 18z nam to show what I mean. Here is the surface map on the left/ 850 mb (near 5,000 feet) temperatures on the right. Usually the rain-snow line is somewhere near the 0 C isotherm at 850 mb. This map is for Wedneday evening near onset. You can see that the 0 C isotherm (in red on the map to the right) is south of all of Virginia. This suggest that most areas start out as a period of snow. Now moving forward in time to Thursday morning, you can see that the 0 C isotherm has now pushed west of Richmond, changing much of I-95 and points east over to a mix. Areas in the tidewater at this point would likely just be a cold rain. Now looking at sounding data for Richmond (kric) for the same image shown above, you can see that this would likely be sleet if not freezing rain. The skew T forecast represents different layers of the atmosphere. Everything to the left of the blue line I highlighted would be below freezing. There's a warm nose around 800-900mb...hence why the 850mb map above shows 850 temps above freezing. This warm layer would melt any falling snow flake, leading to either sleet or freezing rain depending on the rest of the layer temperatures. Now with all this being said, there is the argument "well I don't think the 850 freezing line gets as far west as that". Fair enough. I just don't think you should look at a snow map from one of the runs of the nam and buy 8-12" of snow falling. Right now I see this line between all snow and a sleet/snow mix setting up somewhere from Danville to Farmville to Fredericksburg. This would keep heaviest snow fall to the west of this line and decrease it to the east. Exactly when this changeover occurs will be important, but very tricky to forecast. Like I mentioned before, the rain line may even try to creep in close to I95. This leads me to believe that Richmond will be closer to the lower end of 4-8" amounts rather than the 8+ for areas that see more of this precipitation fall as snow farther west. If the 850 temperatures remain colder longer, the higher side of this 4-8 would work out.